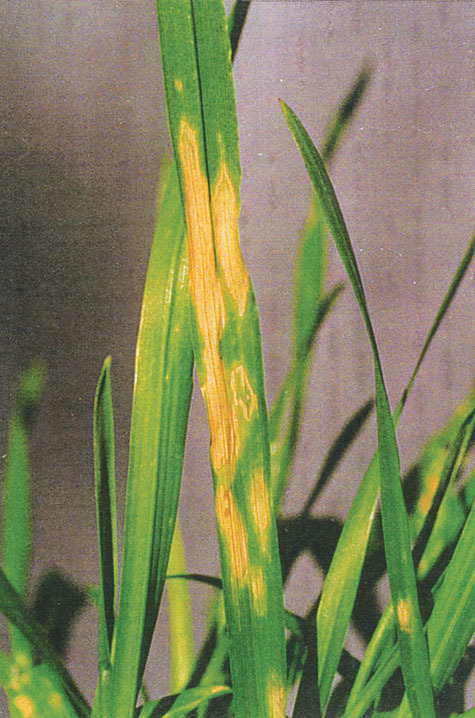 Severe symptoms of zinc deficiency in wheat. Large and spreading necrotic lesions give the leaf blades a “scorched” appearance. Small necrotic spots start in the central regions of middle-aged and sometimes older leaves, and gradually expand outwards. | Photo credit: CIMMYT. This work is licensed under a CC BY-NC-SA International License. Occurrence of copper (Cu), zinc (Zn), iron (Fe), and manganese (Mn) deficiencies in plants have led to the need for laboratory procedures to predict the plant availability levels of these micronutrients in soils. Conversely, predictions of plant availability are also useful to help deal with the toxicity of elements such as aluminum (Al). The extraction solution should be selected to solubilize amounts of the micronutrients that are proportional to amounts that will be absorbed by plants during single growing season. Ideally, you also want an extractant to be effective over a wide range of soil types. Initially single element availability tests (e.g., the 0.1 M HCl extractant for Zn) were developed, but later they were replaced with soil tests, such as DTPA-TEA (diethylenetriaminepentaacetic acid – triethanolamine) extraction, that allow simultaneous extraction of several nutrients. Extractants vary from weak to very strong; depending on the situation (elements of interest and extractant), the literature may allow you to relate results to bioavailability, plant uptake, or toxicity. For this purpose, some trace elements (Cd, Cu, Ni, Pb, Zn) have been better characterized than others (As, Co, Cr, Mo, Sb, Se, Tl). These solutions are weak extractants and are popular for estimating immediate bioavailability. Calcium chloride (CaCl2), calcium nitrate (Ca(NO3)2), and ammonium nitrate (NH4NO3) are salts that can be used. Chelating agents can help remove elements from adsorption sites to estimate the “labile pool” and thus potential bioavailability. These are stronger extractants than the neutral salts, and are sometimes more appropriate for looking at trace elements as contaminants or potential for toxicity. The DTPA-TEA extraction solution consists of 0.005 M DTPA, 0.01 M CaCl2, and 0.1 M TEA (triethanolamine – (HOCH2CH2)3N) adjusted to pH 7.3 with dilute HCl. Courchesne, F., and M.-C. Turmel. 2008. Extractable Al, Fe, Mn, and Si. In Carter, M.R., and E.G. Gregorich (eds). Soil Sampling and Methods of Analysis. 2nd ed. Canadian Society of Soil Science, CRC Press and Taylor & Francis Group. Oxford, UK. Hendershot, W.H., H. Lalande, D. Reyes, and J.S. MacDonald. 2008. Trace element assessment. In Carter, M.R., and E.G. Gregorich (eds). Soil Sampling and Methods of Analysis. 2nd ed. Canadian Society of Soil Science, CRC Press and Taylor & Francis Group. Oxford, UK. Hettiarachchi, G.M., and U.C. Gupta. 2008. Boron, Molybdenum, and Selenium. In Carter, M.R., and E.G. Gregorich (eds). Soil Sampling and Methods of Analysis. 2nd ed. Canadian Society of Soil Science, CRC Press and Taylor & Francis Group. Oxford, UK. Johnson, G.V., and P.E. Fixen. 1990. Testing Soils for Sulfur, Boron, Molybdenum, and Chlorine. In Westerman, R.L. (ed.) Soil Testing and Plant Analysis. 3rd edition. ASA-SSSA, Madison, WI. Kabata-Pendias, A., and H. Pendias. 1992. Trace Elements in Soils and Plants. CRC Press. Boca Raton, FL. Martens, D.C., and W.L. Lindsay. 1990. Testing Soils for Copper, Iron, Manganese, and Zinc. In Westerman, R.L. (ed.) Soil Testing and Plant Analysis. 3rd edition. ASA-SSSA, Madison, WI. Risser, J.A., and D.E. Baker. 1990. Testing Soils for Toxic Metals. In Westerman, R.L. (ed.) Soil Testing and Plant Analysis. 3rd edition. ASA-SSSA, Madison, WI. Soon, Y.K., N. Belanger, and W.H. Hendershot. 2008. Readily soluble aluminum and manganese in acid soils. In Carter, M.R., and E.G. Gregorich (eds). Soil Sampling and Methods of Analysis. 2nd ed. Canadian Society of Soil Science, CRC Press and Taylor & Francis Group. Oxford, UK. Sparks, D.L. (ed). 1996. Methods of Soil Analysis: chemical methods. Part 3. Soil Sci. Soc. Am. Book Series No. 5. ASA-SSSA, Madison, WI. © 2019 Soil Lab Modules. Theme by XtremelySocial.